Chris Simcox always wanted to be famous. Now, in a manner of speaking, he is. 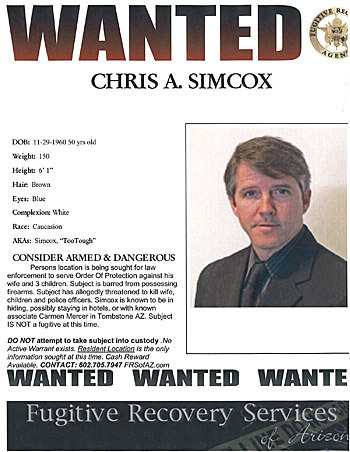 Late last week, Fugitive Recovery Services of Arizona (FRS) released a “Wanted” poster asking for information about the location of Simcox, who it says readers should consider “ARMED & DANGEROUS.” The bounty hunters are seeking Simcox, co-founder of the anti-immigration Minuteman movement, so that an order of protection obtained by his estranged wife in April can be served. There is no warrant for his arrest and he is facing no criminal charges. Alena Simcox was granted a protective order after telling a court that her husband had threatened her and her three children, aged 2, 3 and 8, with a loaded gun, and suggested that he would kill police officers if they interfered. The document orders Simcox to vacate the house in Scottsdale, Ariz., the couple shared, stay 200 yards away from his wife and children, and turn in any weapons to police. FRS is offering $500 for information about Simcox’s whereabouts.